Kill or be killed, champions?! Pfff, we killed! Hailing from the deepest, darkest places of Azeroth here come the true terror feared by all! 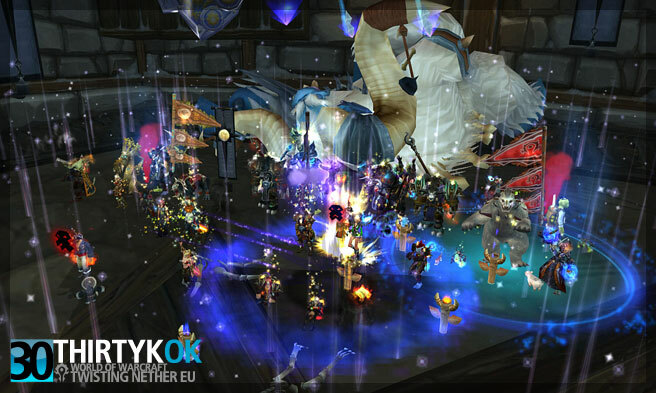 Thirty K Ok vs. Northrend beasts = 1 : 0! Good job everyone! So after a few nights of wiping and a few canceled TotGC 25 raids (OMG, too scary! These beasts will hunt me at night in my bed! In a bad way as well!) we managed to kill them tonight! We decided to use the "Northrend beasts 25 HC for dummies" tactics and apparently this worked way better then I would ever imagine: just follow the pet "retard" around = win (blame Woodward, he came up with that name for the pet)! Easy mode! Again good job guys, especially the trialists who were there for the first time! We did it again! Note the "pet retards" and the dancing bear! About time to be honest! Very good tactic saved our asses. Looking foward for Jaraxxus and Faction Champions to be honest. and follow those pet 'retard' around, lol.